A record number of Trust supporters gathered at the Royal Overseas League club in London on 13th November 2012 for the annual Fontanellato luncheon, which proved to be an uplifting occasion. The annual luncheon is always enjoyable, as it brings together the families of former prisoners of war and celebrates the bravery of the Italian people who gave them refuge while they were on the run. But this time there was an added sense of excitement as we looked ahead to the year 2013, and the 70thanniversary in September of the Armistice with Italy. The Italian surrender was the catalyst for the escape into the countryside of thousands of servicemen seeking to escape the Germans and Fascists and rejoin the Allies. Among the 109 guests were five “originals”, men who had been prisoners in Italian camps: Cavaliere Ufficiale Keith Killby, OBE, the Trust founder; Major Michael Lacey; Mr Rivers Scott, Mr Frank Unwin, MBE; and Major Mick Wagner, MBE. Welcoming the guests, Sir Nicholas Young, chairman of the Monte San Martino Trust, waved the diary that his own father had kept while a prisoner at the Fontanellato camp, near Parma. “I bring it to the lunch every year,” he said. He went on to outline the events that the Trust plans to hold in 2013, and in which he hoped as many supporters as possible would participate. These will include a reception early in the year at the Italian embassy in London, which has been kindly offered by the Ambassador, and a number of different events and trails in September. One of these trails takes place in the Tenna Valley in the north-east region of the Marche, and is being jointly organised by the Trust and the Escape Lines Memorial Society. Another trek – more precisely, a climb – is to pass over Monte Rosa in the Italian Alps and down to Zermatt in Switzerland. This ambitious venture, involving guides, ropes and crampons, is being organised by the family of Colonel Hugo de Burgh, who was British commanding officer at Fontanellato and who escaped along that route in September 1943. In addition, there will be celebrations at Fontanellato itself. Several Trust families are planning to visit the town, which is near Parma, over the weekend of September 8th. Also, the town itself, which has always had strong links with the Trust, is laying on a number of events to mark the anniversary of the Armistice. At this point, Sir Nicholas introduced Dottore Francesco Trivelloni, the deputy mayor of Fontanellato, who had come from Italy for the luncheon with the express purpose of inviting Trust supporters to the town. Mr Trivelloni recalled his own time as a student in London on a Trust bursary, eight years previously, describing it (“and the British weather”) as a great experience. “In Fontanellato we consider it very important that as many as possible of you participate in the events in September,” he said. Resuming his own speech, Sir Nicholas then paid tribute to Mr Vanni Treves, CBE, chairman of the Trust’s fundraising Appeal, for the enormous efforts that he and the Trust’s fundraiser, Mrs Sue Comber, had made over the 12 months since the launch of the Appeal. The total of money raised or pledged had reached £420,000, said Sir Nicholas, adding that the Appeal would continue until the end of 2013 and would, he hoped, be boosted by sponsorships of the trails. 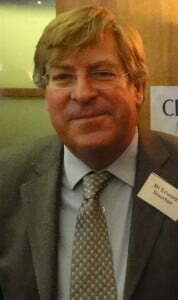 Sir Nicholas then introduced the luncheon’s guest speaker, Mr Edward Stourton, the BBC broadcaster. Reminding the audience that Mr Stourton presents the Sunday programme, is a former BBC Paris correspondent and a founder member of Channel 4 News, he described him as “my favourite broadcaster: those wonderful, mellifluous tones and that sense of deep integrity”. Camp 78 at Sulmona, one of Italy’s best known PoW camps, is to be restored following a long campaign. A memorial service for Frank Unwin, who had been the Trust’s last surviving PoW member, was held at Orpington on December 21st. About 200 first-hand accounts and secondary sources concerning PoW activities in wartime Italy are to be found in Julia MacKenzie’s bibliography.